Creative mind of Sylvie: Less is More - Wk 23 - Something with legs! Over at the Less is More challenge blog this week the theme is - Something with legs- on a One layer card. I thought I would use one of the stamps I designed for Joanna Sheen - the Puffins from the Tales of the Ocean stamp set - on the Fossil sheet. First of all I die cut the nesties 20 shape using a piece of copy paper.. .to use as a mask. I then positioned it on the card - stamped the puffins -masked the puffins so that I could ink the background and stamp the birds (also from the Tales of the Ocean stamp set - A shell that can sing). I drew around the shape with squiggly outlines and then finished with the stamped 'Have a nice day' which I was able to curve slightly because it is a clear stamp. The one mistake that I made was that I manged to get the whole thing off centre... so to even up the sides I used a border punch on the right side... I quite like the happy accident. Stunning images Sylvie and so beautifully coloured. Oh! my gosh love this image and love your card and your colouring. How gorgeous! Your beautifully coloured image is perfect in that curvy shape! This is a gorgeous card, love the stamps. Happy accident, the punched edge looks lovely. The puffins also made me smile, when they all fly together they are so appealing. love the sky effect. Super card. Love the image. 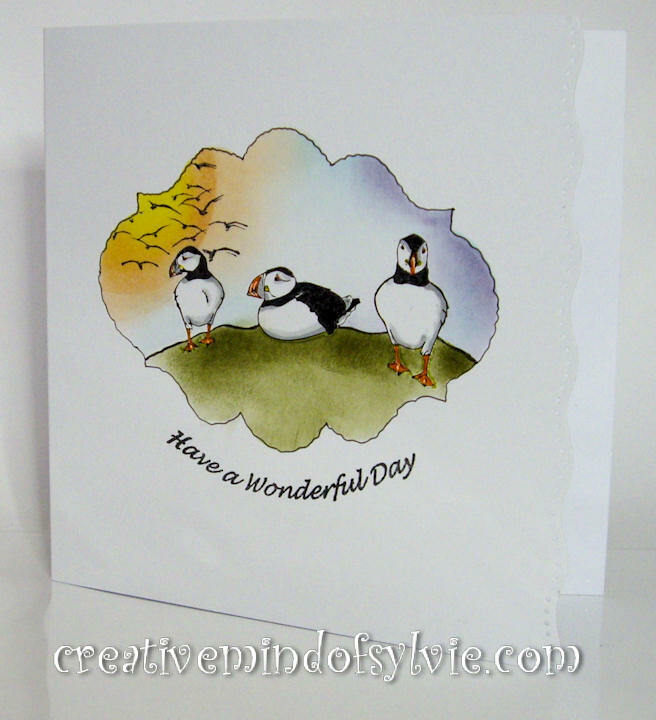 Awww puffins are my favorite birds, what a stunning card! I love this Sylvie. Clever masking and great colours. Clever girl ! great masking never thought of that ! Beautiful images and such gorgeous colours. Fabulous inking, very well done. Gorgeous card. Clever trick with the border punch. Will remember this!I have a bit of a thing for puffins so I'm off to find this stamp set. 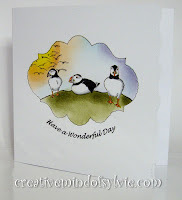 What a wonderful card and love those puffins! Oooh, this is lovely, what a gorgeous image! I love the masking, that's a fab shape you used. I love happy accidents and it's such a bonus when they work well! Love your puffins. Great idea to 'squiggle' round the outline and I love the colours you've used.